As photographers, we are sometimes obsessed with sharp images — this includes getting rid of all blur. Right? Not so fast… I love blur! And now we have so many types of blur from which to choose! When heading out to capture a scenic landscape, we are often confronted with motion in the trees and water. It seems like the natural thing to do is bump up the shutter speed to 1/250th, or 1/500 so that the motion blur is “frozen”. Yet, this is often not an acceptable approach if you also happen to need a need a low ISO, and small aperture opening (like ISO 200 @ f16). In photography, you are always playing a game of “give and take” with your camera and lens settings. Personally, I find myself opting to shoot most scenics at about 1/15th of a second in order to hold down my ISO (below 400) and maintain a full depth of field (f16 or f22). At a fifteenth of a second, I end up with a lot of slightly blurry tree branches, and wavy water. I gave up on trying to fight against blur — now I enhance my blur so that it becomes an appealing part of the image! 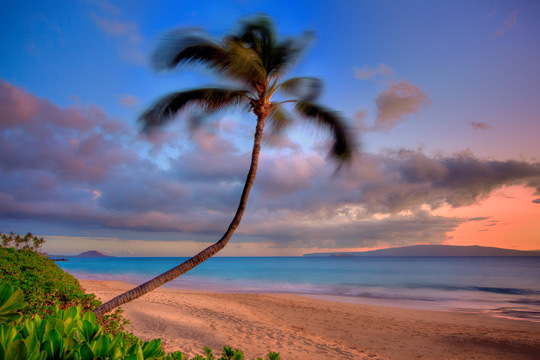 The image above of a coconut tree on the beach, I was unsatisfied with the slight wind blur on the tree and water, so I selectively added a layer of motion blur on the chosen areas to further soften the effect. 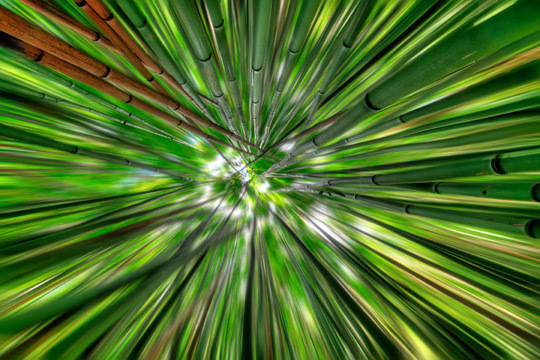 My image of the bamboo patch appeared too confusing to me at first glance, and so I applied a layer of selective radial zoom blur. I used the blur to direct focus to only a selected few stalks of bamboo. Here’s how I love to enhance my blur: I create a new layer in Photoshop, and then go to Filter>Blur>Motion Blur (or another type). I then select the amount of blur I desire, and the angle of the blur, and hit “Okay”. Next, I add a layer mask to the blurred layer and invert the mask so that it is black (in effect, concealing the blur). Finally I take a paintbrush and paint white into the areas where I want to reveal my enhanced blur. Be sure to explore all the types of blur within the photoshop filter>blur menu. My personal favorites for landscape images are motion blur, and radial zoom blur. Blur for sure! Great article. I love blur, but I’ve never worked with the blur filters in the way you described. I’m eager to give it a try. I have a small project of wind blown images on my website.